IS IT A LEGAL VARROA TREATMENT IN THE UNITES STATES? Oxalic Acid has been approved by the EPA to treat honey bee colonies in the United States. It must pass state approval before it may legally be sold in each state. This is a continuing process and a list of states that have been approved can be found on our website. WHEN IS THE BEST TIME TO USE OXALIC ACID TO TREAT? The most effective time to treat a hive with Oxalic Acid is when a hive has little to no sealed brood. It cannot penetrate capped brood so it will have no effect on the next generation of mites that were left in capped brood. You can treat in the spring and summer but research shows that Oxalic works best in the fall/winter. WHEN WILL MY HIVE BE BROODLESS? The best time for a broodless hive is during late fall through the winter. You can also manipulate the hive by caging the queen for 14 days. That keeps her from laying and capping any more brood. 14 days provides enough time to treat your hive and allow the treatment residue to subside before returning the queen to lay brood. CAN YOU TREAT IN THE SUMMER? While some studies say you can treat honey bees in the summer, there are too many variables that can cause issues during summer treatments. Summertime is usually when the hive is full of capped brood so it could take multiple treatments to reduce all the mites concealed with the brood. Continuous multiple treatments can affect the bees severely. CAN YOU TREAT DURING A HONEY FLOW? It has not been approved for use during a honey flow. If you have honey supers on the hive you must remove them before treating and leave them off for at least 14 days to give the Oxalic Acid treatment time to be fully cleansed from the hive to avoid contamination of the honey. HOW CAN IT BE USED TO TREAT? Note: To completely dissolve Oxalic Acid Dihydrate, use warm syrup. Dissolve 35g of Oxalic Acid Dihydrate in 1 liter of 1:1 sugar water (weight : volume). Smoke bees down from the top bars. With a syringe or an applicator, trickle 5 ml of this solution directly onto the bees in each occupied bee space in each brood box. The maximum does is 50ml per colony whether bees are in NUCs, single, or multiple brood chambers. Apply only to outdoor colonies with a restricted lower hive entrance. Seal all upper hive entrances and cracks with tape to avoid escape of Oxalic Acid vapor. Smoke bees up from the bottom board. Place 1g Oxalic Acid Dihydrate powder into vaporizer. Follow the vaporizer manufacturer’s directions for use. Insert the vaporizer apparatus through the bottom entrance. Apply heat until all Oxalic Acid has sublimated. Ensure bees are clustered before applying. Spray broodless package with 1:1 sugar water solution (without Oxalic Acid mixed) at least 2 hours before spraying with Oxalic. This fills their stomachs to reduce ingestion of Oxalic Solution. Mix 1:1 ratio sugar water with 35 grams of Oxalic Acid (same ratio as Solution Method). For a 2 lb package, use 21mL of solution. For a 3 lb package use 31mL solution. Store bees in a cool darkened room for 72 hours before hiving. HOW MANY HIVES CAN OXALIC ACID TREAT? *All totals calculated from dosage amounts listed in treatment methods above. WHAT SAFETY MEASURES SHOULD I TAKE WHEN USING OXALIC ACID? DO NOT let Oxalic Acid make contact with skin, eyes, or be ingested. Wear proper personal protective equipment (rubber gloves, safety goggles, long sleeve shirt) when mixing or distributing Oxalic Acid. If exposure to skin or eyes does occur consult directions and safety sheet for instructions. If severe reaction occurs, call 911. 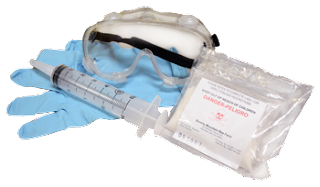 Wash hands, exposed skin, and PPE directly after treatment to avoid contamination. HOW EFFECTIVE IS OXALIC ACID? The effectiveness of Oxalic Acid treatment can be in excess of 95%, but solution method have a higher efficacy. HOW MANY TIMES SHOULD I TREAT MY HIVE? You will only want to treat your hive ONCE during the fall/winter. Honey bees have a low tolerance to Oxalic Acid. Overexposure can cause issues and death in the hive. CAN I USE OXALIC ACID WITH OTHER MEDICATIONS? Since it is a naturally occurring chemical, it can be used in conjunction with other non-varroa treatments. DO NOT mix directly with other chemicals while treating. HOW DO YOU STORE OXALIC ACID? Dried, unmixed Oxalic Acid should be kept in a cool dry place will not expire. Mixed solution can last up to a week at room temperature and a few months if kept in the fridge.